Fruitless Pursuits: Scott Pilgrim's Bryan Lee O'Malley Does Battle Royale! Scott Pilgrim's Bryan Lee O'Malley Does Battle Royale! 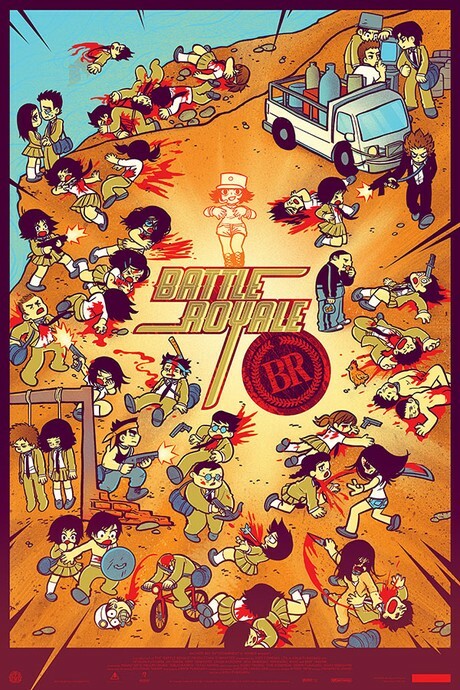 Aint It Cool News have shown off an awesome new poster than Mondo has created for the Japanese kids-murdering-kids-on-an-island cult classic, Battle Royale. And if you haven't yet seen that magnificent, visceral film then rush out and see it - Hunger Games author Suzanne Collins certainly did! I'm not sure if this is for sale anywhere, but Mondo posters sell out fast and command high prices so you'd have to be super quick. We love you, Bryan Lee! Looking forward to your next book!